borrowers they had to leave their army cap. As they couldn’t be seen out on the street without it, they would have to return the book to get it back! That way the library stayed intact for the benefit of those who passed through. The game of billiards was always popular amongst English men (and many other nationalities!) anytime, anywhere. The ‘Toc H’ Every Man’s Club acquired a billiards table, which was well used and treasured just as it would have been in any club back home. Working men’s clubs would purchase a billiard table or two if they had sufficient funds and space and they were frequently in use. Tubby Clayton wrote: ‘It all began with small billiard-table, which came from Gamages in Holborn. There was furore of its first arrival then news spread, and callers multiplied.’ This was the sole English table in Flanders so its attraction was great. Yet there was an agreement not to play on Sundays when services were held in the chapel upstairs. Those who only had their precious time off on that day accepted the rule even if leaving disappointed! 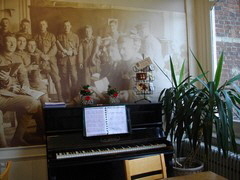 For those on their way to the front line, a Talbot House sing-song round the piano could have the last bit of cheer they would know for a long time.